The Department of Chemistry of St. Teresa’s College was established in 1966, under the charismatic leadership of Dr. (Sr.) Bertille. It offers undergraduate, postgraduate and Ph.D. programmes in Chemistry. Faculty members have excellent academic credentials and are highly regarded. 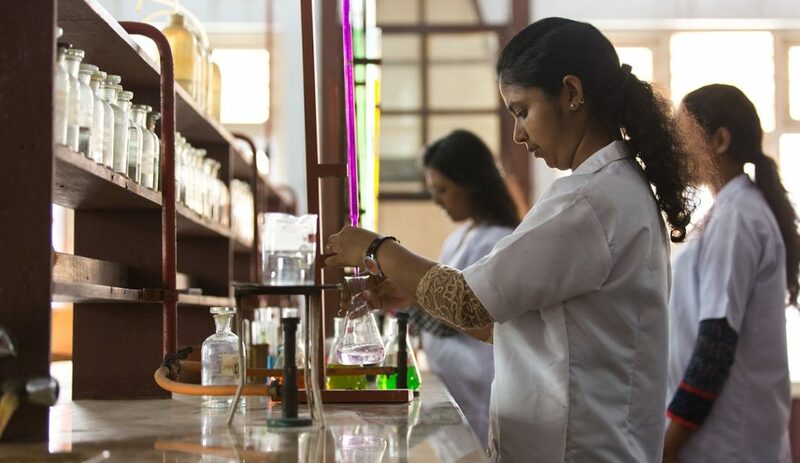 All the permanent faculty members are Ph.D holders with postdoctoral experience from Cochin University of Science and Technology, University of Minnesota (USA) & Georgia Tech (USA) and have been conferred with many prestigious national and state awards. They also serve on the editorial boards of national and international journals, review technical articles for journals on a regular basis. The department has a distinguished record in both academics and research. The Department has a research centre equipped with new scientific instruments. The research groups of the department are engaged in highly productive research work in some of the important areas of Chemistry such as nanomaterials, metal complexes, polymer nanocomposites, green synthesis etc. They have been publishing their work in reputed international and national journals and executing externally funded research projects. Text books based on curriculum are also written by faculty members on regular basis. Over the years the department has conducted several excellent International, national, state and regional level seminars and workshops on frontier areas of chemistry for the benefit of students, faculty and research scholars. The good work of the department has been recognized by DBT and DST through the award of DBT-STAR college status and DST-FIST funding. The Department of Chemistry and Research center endeavors to become a leading provider of interdisciplinary approaches to Chemistry Education and Research that attracts and prepares diverse students to be scientifically literate, socially committed and competitive professionals to meet the future demands of the changing global environment. The Department of Chemistry and research center will be a platform for an individual’s holistic development to make an effective contribution to the present global scenario. Greetings from the Department of Chemistry !!!! The Department of Chemistry was established in the year 1966, has completed 53 glorious years in its pursuit of excellence and was upgraded as a research center in 2018. The Department has moulded young girls of many generations into outstanding women, who have served the community in many ways. The Department has always ensured that the students entrusted to our care are inculcated with high morale, spiritual values and ethics. The main emphasis of the Department is on the creation and application of knowledge and remains committed to the overall development of students by integrating teaching, research and co-curricular activities. The Department is also fortunate to receive the unstinted support and cooperation from our aluminae, STARS, PTA and Non-teaching Staff. Above all the guidance and blessings we have received from the almighty has helped us to reach this far and we firmly believe that the same grace will lead us ahead in the years to come.